How Long Is Deep Brain Stimulation Effective for Essential Tremor? Deep brain stimulation of the ventral thalamic nucleus ameliorated severe essential tremor in the short-term, but its efficacy waned over the course of 10 years. The effects of deep brain stimulation (DBS) on essential tremor appear to diminish over time, according to a report appearing in the February 20 online edition of Neurology. The authors of the paper and expert reviewers also agreed that although the waning effectiveness is an important clinical consideration in weighing risks and benefits of treatment options, DBS continues to provide significant tremor improvement even ten years out. A total of 51 patients with severe, medically intractable essential tremor underwent bilateral DBS surgery between 2003 and 2011. Twenty patients were included in the final, follow-up analysis. In the surgery, electrodes were implanted bilaterally into the thalamic ventral intermediate nucleus (Vim) of the thalamus with contacts extending into the subthalamic area of the zona incerta. Stereotactic MRI was used to define the target coordinates and the trajectories and up to five microelectrodes were used for intraoperative target localization. The final stimulation site was determined as the best compromise between good therapeutic response and high threshold side effects. The primary outcome measure was tremor severity as assessed by the essential tremor rating scale (TRS). The patients were assessed between 32 months (short-term) and 120 months (long-term) after surgery with a full examination including the TRS rating scale, activities of daily living scale and quantitative tremor assessment with accelerometry, among others. Patients were tested in the Vim-stimulation on- and off-condition. Dr. Deuschl and colleagues found that tremor severity in the stimulation-off condition worsened from an average of 56.3 points at baseline to 76.5 points at long-term follow-up. In the stimulation-on condition, tremor severity worsened from a mean of 20.9 at short-term follow up to 43.2 at long-term follow-up. Yet, importantly, in the on condition, DBS provided significant benefit over baseline at short and long-term follow-up. He added that there are few alternatives to DBS. Focused ultrasound lesioning, recently introduced, can only be applied unilaterally and patients with axial tremor (head, voice, titubation) do not sufficiently respond to unilateral lesioning. Moreover, long-term effects of this treatment are unknown. Daniel Leventhal, MD, PhD, assistant professor of neurology and biomedical engineering at the University of Michigan, who reviewed the report said the evidence is convincing that, at least in essential tremor patients in their 60s, the benefits of DBS diminish over time. Although it is a small, uncontrolled study, the results “match well with my anecdotal clinical experience,” he said. “Blinding the raters and using multiple outcome measures, which all more or less gave the same answer, support this finding,” Dr. Leventhal said. However, he cited some caveats: patients in this study were an average of 66.6 years old when implanted so it is not clear if the same results would also apply to younger patients. And it is unclear how the tremor rating scale translates to disability and/or quality of life. Dr. Leventhal said patients should be screened by an experienced DBS team and fully informed about known potential risks and benefits. The evaluation usually includes neuropsychometric testing, a brain scan, a formal tremor evaluation, and presurgical evaluations. Patients should have failed a reasonable trial of tremor medications (or have a contraindication to the medication). Dr. Deuschl said clinicians should advise patients about the likelihood of habituation over time but explain that DBS is still a treatment of choice. “This study gives us important additional information for patients to consider when making that decision,” he said. Dr. Deuschl has received lecture fees and has been serving as a consultant for Boston Scientific. He received royalties from Thieme Publishers; he is a government employee and receives through his institution funding for his research from the German Research Council, the German Ministry of Education and Research, and Medtronic. Drs. Leventhal and Zesiewicz had no disclosures. •. Paschen S, Forstenpointer J, Becktepe J, et al Long-term efficacy of deep brain stimulation for essential tremor: An observer-blinded study https://n.neurology.org/content/92/12/e1378.long. Neurology 2019; Epub 2019 Feb 20. 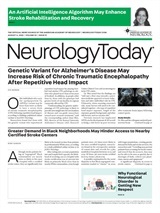 Neurology Today19(7):1,12-13, April 4, 2019.